Custom T-shirt. Cotton Combed with Great Quality and Cheap. Cotton 20s t-shirt is a t-shirt made of cotton material (dense fiber) with 20s yarn thickness (180 - 220 g / m2), soft fabric fiber as it is made from cotton fibers that absorb sweat. Therefore it is comfortable and is not hot. Fabric material and color which custom.co.id uses is high quality with consistent color stability level and will not fade when it is washed. Chain stitching type on the shoulder makes the t-shirt durable. 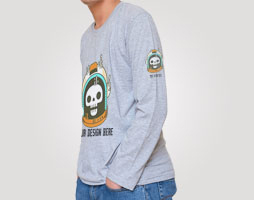 Added with inner collar fabric list (BIS) makes the t-shirt comfort and looks exclusive. T-shirt body connection and sleeve or armpit neatly stitched. Inside part of the t-shirt is overlock stitched. The edges of the t-shirt (down side and sleeve) is neatly stitched. Cotton 20s t-shirt designed without a brand mark. 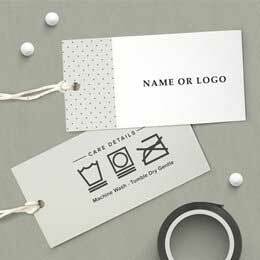 Brand printing service is available only for the custom.co.id member. 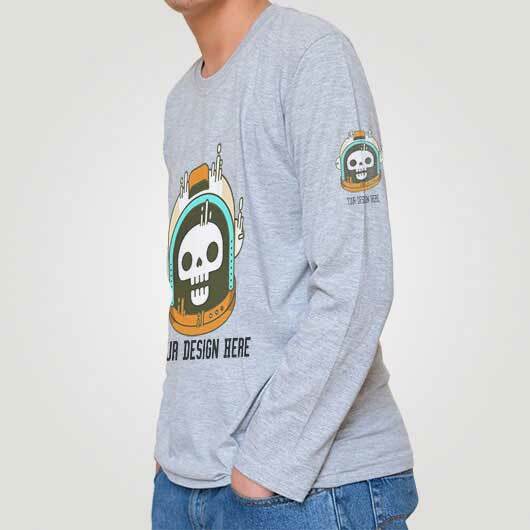 In custom.co.id, Cotton 20s available in short sleeve design with o-neck and v-neck collar (for selected colors), long sleeve with o-neck with selected colors. Use Local T-shirt, A Simple Way to Show Your Nationalism! There are many ways that people can do to love their own country. There are those who are directly involved in becoming sea guides such as Maritime Affairs and Fisheries Minister Mrs. Susi, some have introduced Indonesia to world-class beauty events, some have played in high quality films, and many more. All people have the right and can show their loves for the nation in various ways. Wearing a local t-shirt can be one of them. 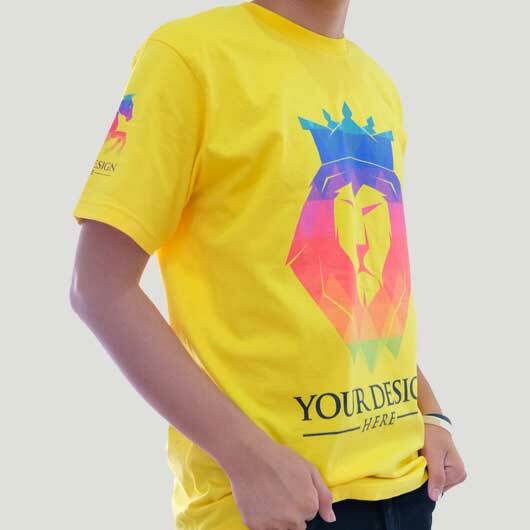 By using a T-shirt product made by our people, you help the economy of many people. Nationalism does not need to be demonstrated by brutal action. Simple ways that start from yourself and the environment itself will have an impact if done continuously. The quality of local t-shirt cannot be seen with bird’s eyes. It is made of best selected material which produced by skilled hands with strong right stitches for the product durability. Produced in many sizes, models, and colors to fulfill the market demand. 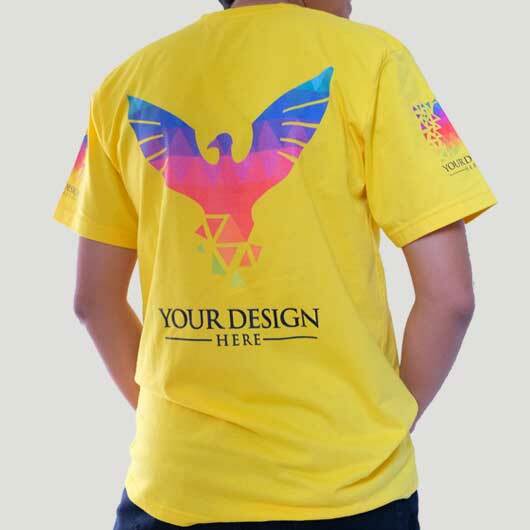 This t-shirt product can be just straightaway be worn or you can be a little bit creative and make it as custom local t-shirt. For you the ones who are not satisfied with ready to wear product you can freely add some sweetener with the local t-shirt printing service. 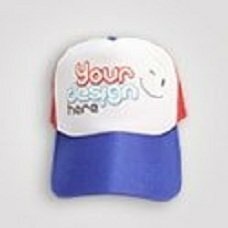 Be creative with you own brilliant ideas and cooperate with the custom printing service in your town. The local t-shirt usually comes with white label on the behind part of the neck. It is function to give the brand owners putting the logo brand for marketing their products. 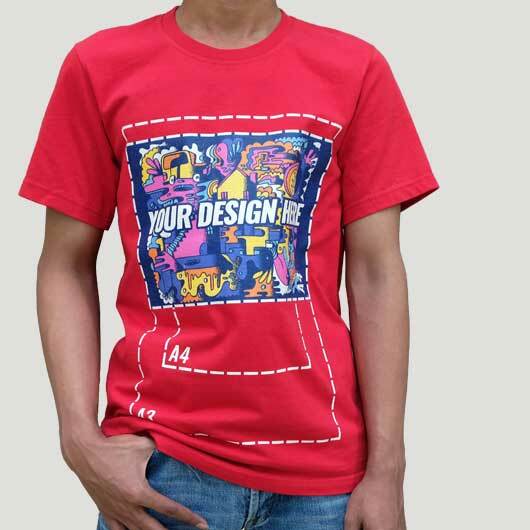 Combed 40s t-shirt, made of cotton material with 40 density when it was produced from the yarn to fabric. T-shirt with 40s combed materials is the thinnest one. Some brands like it to produce tropical country friendly t-shirt. Combed 30s t-shirt, it has more density than the previous one. It usually used by the factory outlet enthusiasts. Its thickness offers a cool use, suitable for tropical country. 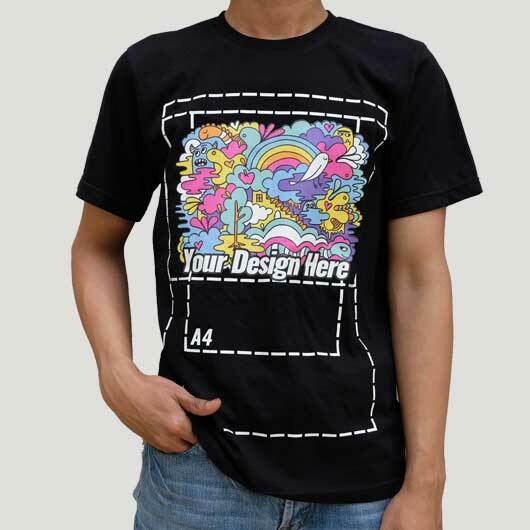 Comber 24s t-shirt, it s a thicker combed with a just right density. It is the most searched as the density really comfortable to use. 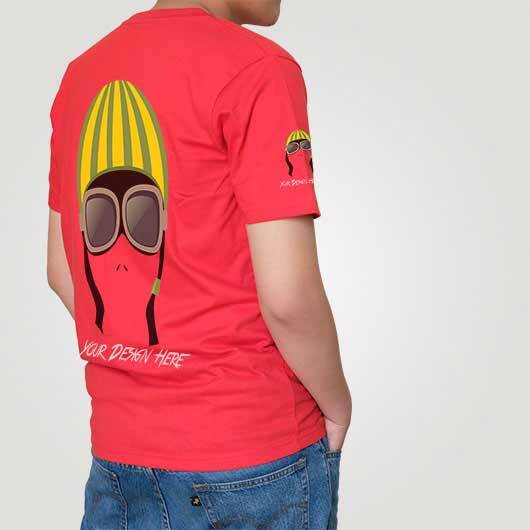 Comber 20s t-shirt, it is called as the most favorite local t-shirt as many seller provide this one. Besides, many combed 20s plain t-shirt seller rise to fulfill the clothing business. Local t-shirt printing now is considered as an affordable and profitable choice. It is a basic tips. Simply wear the light blue jeans with a fit plain white t-shirt, you already got a James Dean look. Also collect the black, navy blue, and grey t-shirt as these colors are easy to match with other colors. The chino pant character which is neat but casual and its universal that can be worn for formal and casual event is a match for t-shirt. Wear white color t-shirt and creamy color chino, black t-shirt and creamy chino, white t-shirt and green chino; your look will be upgraded to a more stylish one yet simple and cool. Either it is a jeans short pant or nylon ones, or even a short chino pants, you will look younger with mix and match bright color t-shirt with a dark or bright color short pant. Complete it with a pair of flip-flop with the same color as your pants or your t-shirt for a more interesting look. Wear a t-shirt with a contrast color against the outer you wear. For instance, your pant is black and your t-shirt is white, you can wear a black color outer. Monochrome style never fails in any occasion. 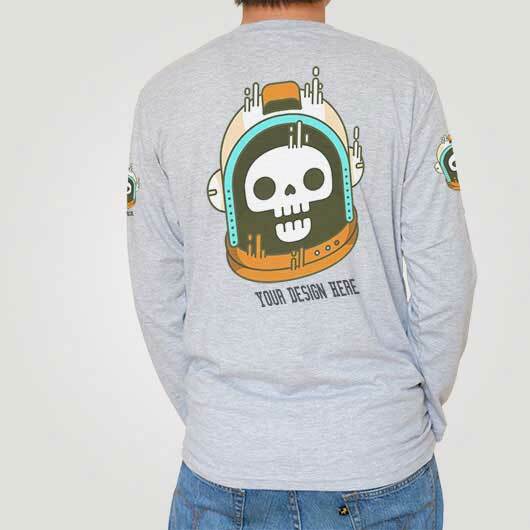 Best Quality Combed 20s T-shirt is Available in Custom.co.id! 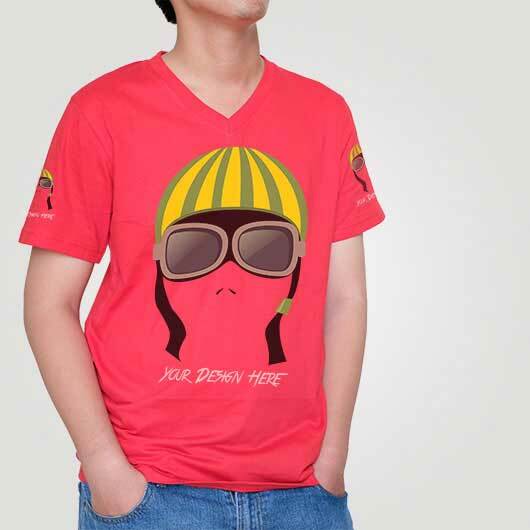 Do you want to make custom t-shirt with combed 20s local t-shirt? Congrats, you are on the right place to get what you want. 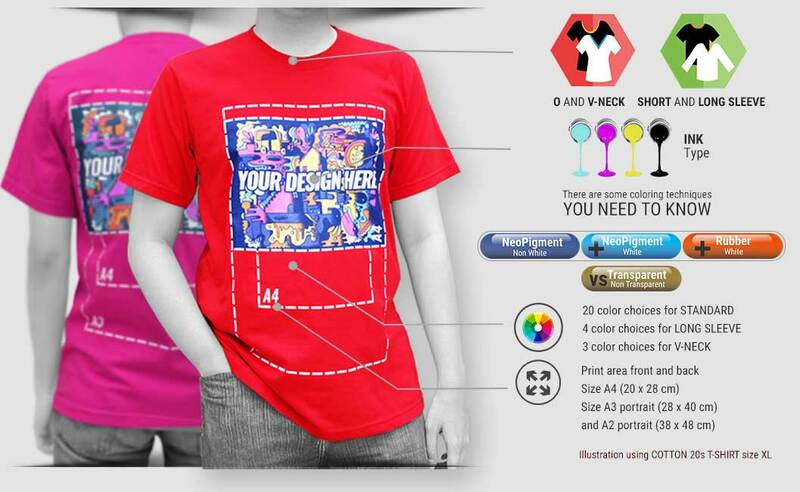 Custom.co.id is one of the best place for your garment printing needs. 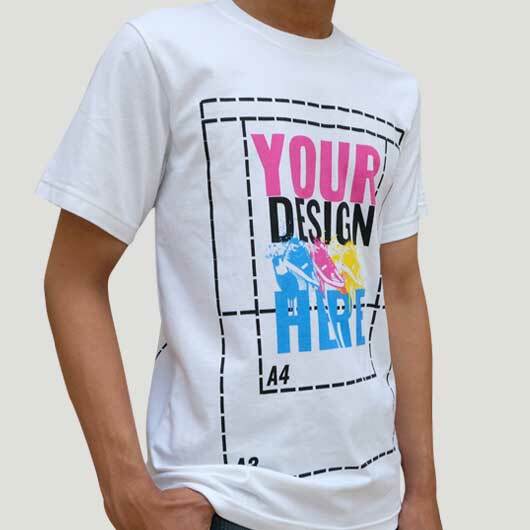 You can make custom local t-shirt with you own design to be your own collection of for business purposes. 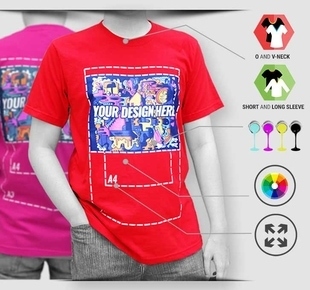 The order process is practical, simple, and safe that it is suitable to be the partner of t-shirt creator. The best material, experienced professional, and the latest advanced technology we own will automatically give the high-quality printing product. The delivery service partner is also the most reliable one. Your order must be arrived. What are you waiting for? 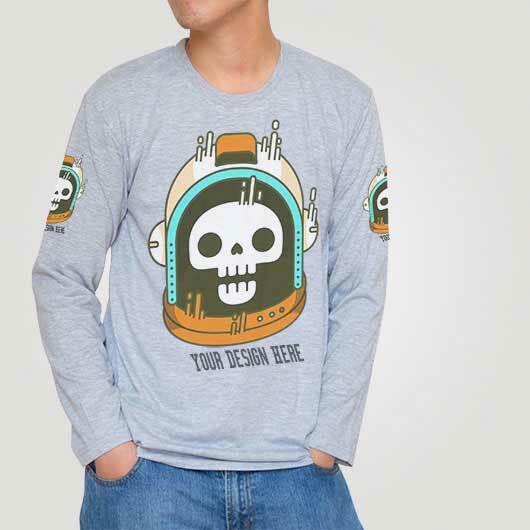 Order custom t-shirt with local combed 20s t-shirt only in Custom.co.id!